The best way to have excellent handwriting is to be taught it correctly at the very beginning – the skills we receive at early age get deeply imprinted and it is extremely hard to re-learn them later on. In this respect handwriting is similar to language – you can learn a language easily when you are little, but learning one in adulthood may turn out to be a much less trivial task. However, if you haven’t developed the skills of good handwriting as a child, you are not as hopeless as some would like to believe. There are ways of improving your handwriting. Before you set about improving your handwriting you have to determine what is wrong about it. So write: take a passage from a book and write at least several paragraphs – the more the better, as it gives you more ground for drawing conclusions. Define the characteristic features of your handwriting: what is its shape (angular, round or shapeless), is it slanted to the left or to the right too much, how are the words and letters spaced, how large are they, are the lines straight or not? Then look if your writing corresponds to several generally accepted conventions. Slanting shouldn’t be too great, otherwise it makes reading difficult. Words should be neither cramped too close nor spaced too widely apart – the rule of the thumb is to leave enough space between them for a letter ‘o’ of normal size. Speaking about size, letters should occupy a little bit more than half the space between the two lines – much more or less both affect readability negatively. Now, taking all this into account, you have to determine what exactly you have to improve. The first step is to look at examples of handwriting you like. Visit a couple of font website and look for the ones you like and towards which you can alter your own writing. Try your hand at imitating them, choose the one that suits you best. 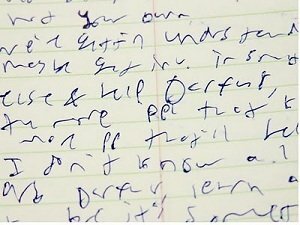 Now, quite often your writing suffers as a result of incorrect handling of the pen. The generally accepted way of holding it is between your thumb, index and middle finger by its first third from the tip. If you do it another way, consider relearning it from scratch – this method has been developed long time ago and nothing better has been invented since then. Most mistakes in handwriting originate from the inability to draw some basic shapes in a correct, regular and consistent manner – as a result all the letters are of different shapes, sizes and alignment. In order to prevent this you have to start at the beginning, where children start when they learn to write: at drawing these round ‘o’s, straight lines, curves and so on, and trying to make them look as similar as possible. After that you can move to the alphabet itself, and again, write the letters over and over, trying to develop new habits. Unfortunately, there are no better ways of doing it – only by defining new habits and painstakingly practicing them, you may hope to achieve automatism in it in the course of time. Hopefully these tips will make this task easier.